By serving communities, we serve the greater community. Our teams empower residents to give back to important causes close to their own hearts. At Power Ranch in Gilbert, Arizona, this manifests itself in the annual Quartermania fundraiser. A partnership between the community association and the Association of Power Ranch Entrepreneurs (ASPiRE), the Quartermania auction raises funds for a local charity. This year, the event benefited House of Refuge, a faith-based organization in Mesa helping homeless families in crisis by providing transitional housing and supportive services. Together, ASPiRE, the on-site team and Power Ranch homeowners raised $12,635.97 – exceeding this year’s goal of $11,000. 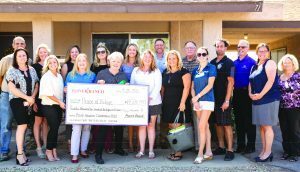 These funds allowed the Power Ranch Community Association to adopt a House of Refuge home for one year. This adoption includes safe housing, utilities, monthly food boxes, community center access, financial literacy programs, comprehensive support services and more. Last month, members of the Power Ranch Board of Directors, on-site CCMC team and ASPiRE presented a check to House of Refuge. A plaque recognizing the community’s contribution now hangs on one of the organization’s 88 transitional homes. Learn more about House of Refuge.